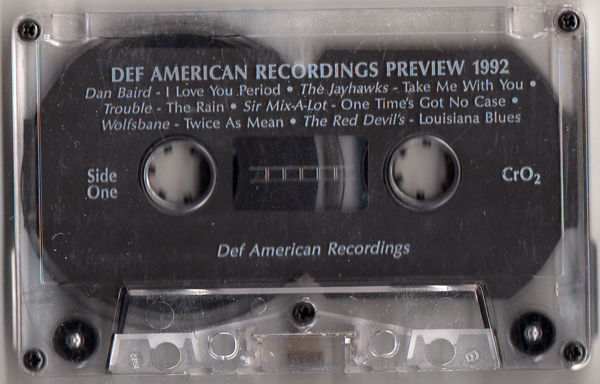 Posted in red devils with tags def american, king king, rick rubin on July 28, 2017 by J.J.
On this day in 1992, The Red Devils’ debut album, “King King,” was released on Def American Records. The party will be on tonight as the reunited Red Devils open for ZZ Top at 3 Arena, Dublin, Ireland. Posted in red devils with tags def american, in the studio, Johnny Cash, king king, Mick Jagger, red hot chili peppers, rick rubin, The Greatest Music Never Sold, tom petty on January 20, 2010 by J.J. Simply calling Rick Rubin a “producer” misses what has made him such an important modern musical figure: He has been a guru, shaman, caretaker, curator, therapist and friend for many artists, coaxing some to produce their greatest music ever. What he does simply cannot be reproduced. 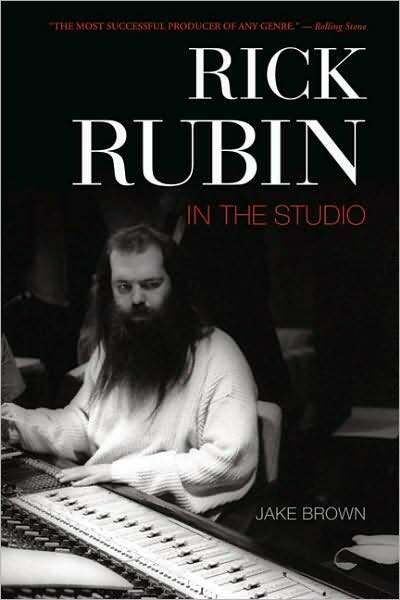 Using already-published interviews as a backbone, author Jake Brown constructs a discography-based look at Rubin’s career in the recently released book “Rick Rubin: In the Studio” (ECW Press). Not a tabloidy tell-all, “In the Studio” instead is a gearhead’s delight, giving some insight into the famed Rick Rubin recording process. Red Devils fans, however, will be let down — the Devils’ Rubin-produced “King King” is not mentioned save for a discography at the back of the book. 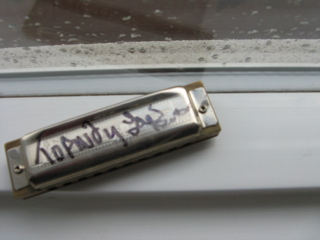 The lone mention of the Devils in the text is a graph about the Mick Jagger blues sessions, not even noting that this “Los Angeles blues ensemble” was a Def American band. However, there are some insights that can be gleaned into “King King” by studying Rubin’s other works and his philosophy — his less is more, or “production by reduction,” style. 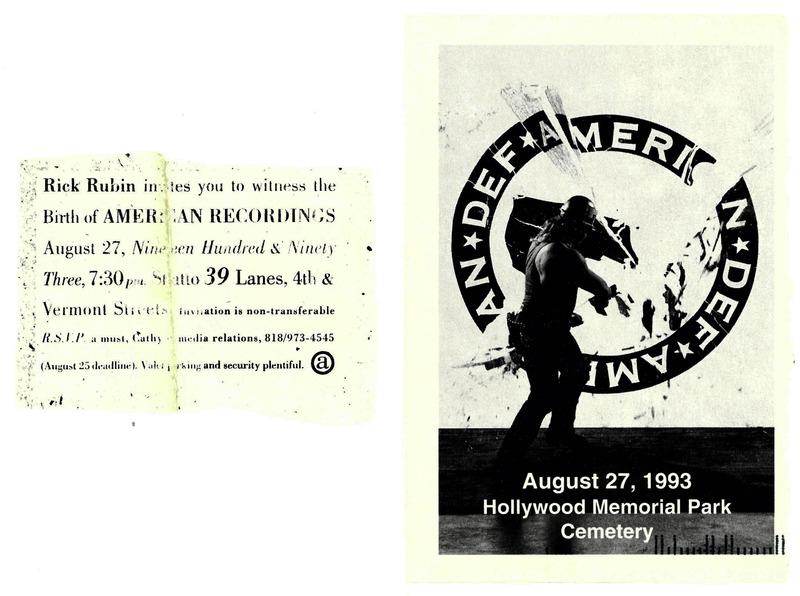 Posted in red devils with tags american recordings, blasters, bruce springsteen, def american, four horsemen, harmonica, jack's sugar shack, lester butler, rick rubin on December 23, 2009 by J.J.
Posted in red devils with tags blues, def american, hollywood fats, junior watson, king king, music, red devils, rick rubin, variety on February 11, 2009 by J.J. 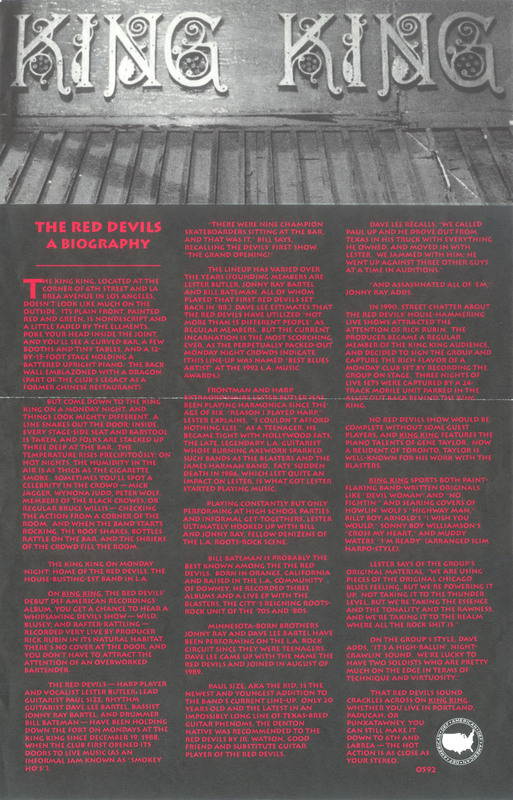 The main piece in the kit was the Red Devils’ one-sheet, a pretty detailed bio of the band, with nods to Hollywood Fats, Junior Watson and more. This is still some required reading for Devils’ fans — it sort of fills in the mythological blanks, and pegs the trio of Lester Butler, Bill Bateman and Jonny Ray Bartel as the three founding members.